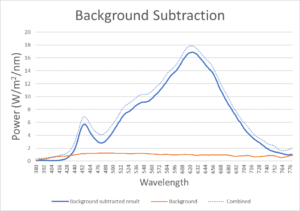 ' Background Light Subtraction - Eliminate background light when taking a measurement with the Lighting Passport Spectrometer - National Photonic Ltd.
To take an initial background measurement, simply turn off the light source of interest and select the centre icon in the Spectrum Genius Mobile APP. Then turn the light source to be measured back on and take a measurement using the icon. The measurement will now be made with the initial background subtracted across the spectrum. This spectrum was taken on a 2700K source in a room that had the blinds drawn. The orange trace is the background measurement that was automatically subtracted. Although the background level seems relatively low, the correction is an important one. The table below illustrates the impact that the residual background daylight entering the room would have had on the illuminance and colour temperature measurements. 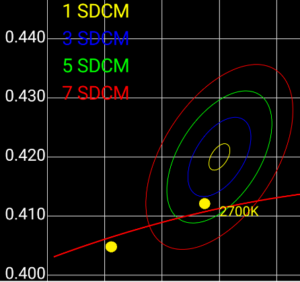 Looking at a combined plot of both measurements on the 2700K IEC SDCM macadam ellipse highlights the impact that the background daylight would have had on the CCT measurement if background subtraction not been used.